The Archdiocese of Detroit, the administrative body that looks after the Roman Catholic churches, schools, and communities in southeast Michigan, encourages everyone to partake in the Christian sacraments and activities in the Catholic churches in Detroit, MI. People who are not yet Catholics, but interested in knowing more about Christianity, are welcome. Through active involvement in these Catholic churches, a Christian community thrives in spreading the good news and living the Word of God. 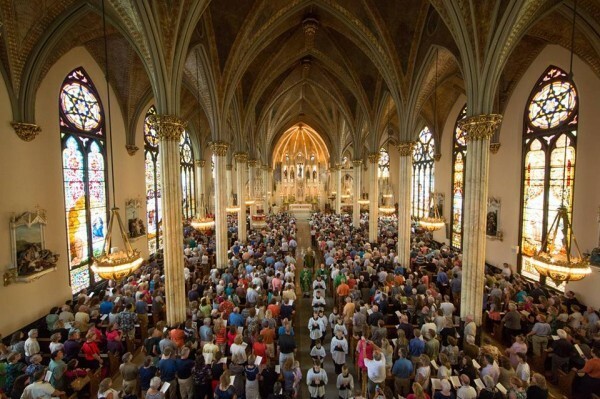 Christian sacraments are practiced in all Catholic churches in Detroit. Baptism, Eucharist, confirmation, confession, anointing of the sick, Holy Orders, and matrimony are conducted in these parishes. Christians can also access the following services: the initiation of adults, funerals, and dedication of churches. Each sacrament has meaning and purpose to the Christian faith. They stress the importance of following and reinforcing the commandments of the Lord and reading the Bible together. Taken together, these sacraments aspire to cleanse the human spirit and prepare for the time of passing to the Kingdom of God. The Christian community encourages participation in all spiritual and community activities. Catholic believers can attend the mass every day, while participating in other religious activities, such as those from church organizations and groups. Several Detroit Catholic churches are historic structures with beautiful architecture. Old St Mary’s, for instance, is the third oldest Roman Catholic Church in Detroit. It is also the first German Church built in 1841 by a parish of German Catholic immigrants. The present church was made in 1884 and followed the Victorian Gothic style. Old St Mary’s’ striking polished interior columns are composed of solid granite. They are exceptional because they cannot be easily replaced at present. Christian communities in Detroit also contribute to other local parishes and churches, which support general community-building programs and projects, such as feeding the poor and helping people during disasters and illnesses. The Christian community aims to strengthen bonds with and among the faithful through both sacraments and local events. Catholic churches in Detroit believe in sharing the sacraments to the faithful, old and new alike. These rituals link them to Jesus Christ by living according to the Word. Christians celebrate these sacraments to be one with God and with each other.